What is that? What does it do? Why the hell does it cost $130 dollars? It's a special noise-cancelling fork for eating ramen noodles (really, I am not making this up). Its audio sensors detect when you're slurping your noodles. It then connects to an app on your phone to make noise to cover up the sound. I'm still not sure why it costs $130, but assume it's all in R&D, and all the ramen noodles packs and starving students that were needed to test it. When it's dry inside, just call on the King of Monsters to remedy the situation with a sustained blast of his legendary atomic breath. 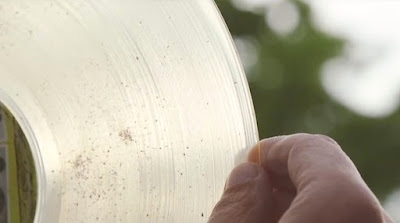 can press your (or anyone's, or anything's) cremated ashes into a 33 rpm vinyl record! You can include a recording of your voice (threatening to haunt them forever if they scratch, warp, or donate you to a thrift store) or any favorite music. You can also have a pet turned into an album for those nights when you miss their barking, meowing, or repeatedly asking for a cracker. Imagine the looks on their faces when they receive such a unique gift and wonder where the hell they're supposed to find a record player in 2017! These electric-orange-reddish pickles are made by marinating them in fruit punch instead of brine. One bite of a burger topped with these and freeloaders will never darken your barbecue again! This delightfully cheery playset includes a narwhal, 4 tusks (which look vaguely like lightsabers, so maybe it's an EP9 character Darth Cetacean) and 3 cute little animals you can impale! Personally I think they should throw in another impale-ee, one for each tusk. Exactly how penguins and narwhals encounter each other in the first place, let alone koalas, isn't explained. For those of you who hate street mimes (hey, who doesn't) there's also The Avenging Unicorn playset. with attempted burglary and violating his probation from a previous burglary conviction. Residents of the village Ringaskiddy have fallen on hard times. There have been multiple solid complaints about men and dogs walking around with, uh, woodies. Apparently they have a bone to pick with the local Pfizer plant, where Viagra is manufactured. The waste exhaust from the factory reportedly is being carried by a stiff breeze into the surrounding community. Local barmaid Debbie O'Grady commented "one whiff and you're stiff." An unidentified opossum broke into a liquor store and got trashed on bourbon. The marsupial knocked a bottle of bourbon on the floor, breaking it, then drank the contents. The animal was "disoriented" when found and taken to a local animal shelter. She was given fluids and allowed to detox, then released into the wild. And finally, from the "do not try this at home" department, is this. "Luke, I am your vacuum." The Samsung Powerbot home vacuum promises to not only clean your floors, but randomly play lightsaber sounds, the heavy breathing of the Sith Lord (so you can worry someone broke into your house) and snippets of movie dialogue. You can control them with voice, the phone app, Amazon Alexa, and Google assistant to convince your technophobic friends that you, indeed, have the power. Better yet, you don't have to deal with your teenagers. These are the droids you're looking floor. Disclaimer: I did NOT get paid for this post, and do not own this gadget. I just thought it fit in with the other odd things I feature. I have no idea how well it works. I have a wife, 3 teenagers, and 3 dogs, all smarter than me and have no desire to have household appliances that are, too. The Christmas Gift Guide, 2017! Now they don't have to awkwardly leave their liver toxin of choice at the dining table or on the bathroom counter. It can be immediately handy while using the facilities, letting them take a nip (or more) between wipes and helping to spread some horrible diarrheal illness amongst family and friends. After all, the holiday are all about sharing.